Halloween Chex Mix - chocolate coated chex mix with candy corn, pretzels and chocolate. Sweet & Salty! Takes minutes to make. Great for class party treats! This Halloween Chex Mix should come with a warning label! I could not stop eating it!! 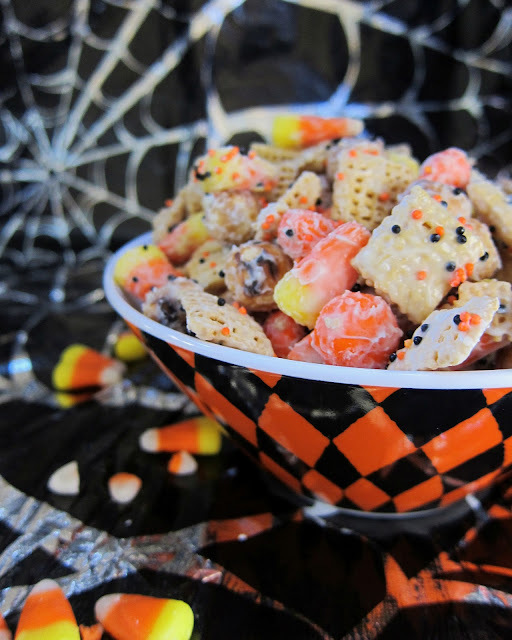 This is similar to the Monster Munch on the blog, but this is made with Corn Chex and Candy Corn M&Ms. This Halloween Chex Mix is so easy to make; it only took about 5 minutes. The hardest part of this recipe is waiting on the chocolate to set so you can eat it! Portion this out into festive bags for a great treat for the classroom and neighbors! In large microwavable bowl, microwave white chocolate chips uncovered on High 1 minute 30 seconds to 2 minutes 30 seconds, stirring every 30 seconds, until melted and smooth. Gently stir in cereal, pretzels, candy corn and M&amp;Ms until evenly coated. Toss the sprinkles over the mixture. Spread on waxed paper until chocolate is set, about 30 minutes. Break into chunks. I am having a Halloween party this very weekend. I cannot wait to try this. Thank you! I have been looking for those pretzel balls for a while...where did you find them? Do you happen to have an Amish bulk store anywhere in your vicinity? I know our store has them. Not only does it sound good, it's cute. Luv the Halloween colors. You are right-this is hoghly addictive! Everytime I take this to snack on, they want the recipe. Thank you. Can you suggest a substitute for the candy corn? I'm not a fan of that stuff (I know, I'm crazy). I'm not a candy corn fan either. You can leave it out and add more of the other stuff. you can't go wrong with reese's pieces! This was really awesome but my chex mix was soggy the next day. What did I do wrong?